On January 20th, 1961, President John Fitzgerald Kennedy was sworn in as the 35th President of the United States. At age forty three, he was the youngest president ever elected in American history. During President Kennedy’s first year in office, the United States and former Soviet Union were in competition in what has been called “the space race.” And on April 12th, 1961, Russian Yuri Gagarin became the first human to go into outer space. The following month, American Alan Shepard became the second human and first American to achieve the same feat. The accomplishments of the United States and Soviet Union inspired the world. 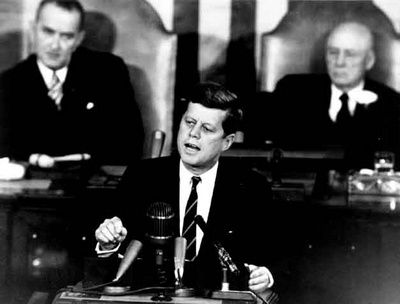 The Russians had reached space first, and President Kennedy did not want to lose ground in “the space race.” So he challenged America to send astronauts to the moon and return them safely to the earth before the end of the 1960’s. In a speech before Congress, President Kennedy said: “We should do this, not because it is easy, but because it is hard.” In other words, for America to achieve great things, we must set goals for ourselves that others may think impossible. NASA, which is America’s National Aeronautics and Space Administration program, continued to send more astronauts into space after Alan Shepard’s first successful mission. 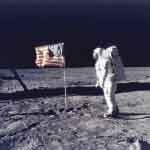 And in 1961, the Apollo program, which was NASA’s moon mission program, was officially created. On July 16th, 1969, three American astronauts blasted off on the Apollo 11 Saturn rocket, headed for the moon. After four days and over 235 thousand miles, the Apollo 11 crew had reached the moon’s orbit. As astronaut Michael Collins stayed aboard and piloted the command module, astronauts Neil Armstrong and Buzz Aldrin made the first manned landing on the moon’s surface. The name of their lunar module spacecraft was Eagle. After returning safely to earth, America felt great pride for what the astronauts had accomplished. There were parades in their honor and the astronauts went on goodwill trips to countries around the world.